A couple things. Someone could have pulled your 5th wheel, a slow leaking tire deflated, and someone could have a tied a poop bag to your trailer (believe me or not this actually happened). Here is to many more years behind the wheel. Keep the shiny side up! That is awesome to hear. Are you team driving out to California, Oregon, or? I live on the westside so I live near all the LTL barns. Hope to get on with one of them when my record clears up (hit some stuff my first year). JB Hunt Dedicated Questions / No Co. Review? If you want true OTR experience, then go OTR. Dedicated can be like OTR, we have two members that are on dedicated accounts and go all over the country. However for the most part most dedicated has you home daily or at least once a week. I do walmart dedicated in New Mexico. We service New Mexico, Southern Colorado, El Paso, West Texas, and Guymon Oklahoma. Times like last week I was home every night and other weeks home every 2 to 3 nights. It can be a difficult account mainly due to crazy hours. One day you will start at 10 am and the next start at 9 pm. I like dedicated because I am not sitting at truck stops very often, always have work, and for the most part never have to worry about miles. Being that you want to eventually run with touring bands it would be good to get with an OTR company or a dedicated account that covers more than just where you live. Some other places to consider due to your location are Millis (not fully otr being that they don't seem to go out west), Swift, Werner, Schneider, Marten, and H.O.Wolding, just to name a few. Where do you live and what terminal are you out of? Have you made steps to talk to your dm? I ask for location because there may be a dedicated account nearby. Honestly with my time at swift I have had a better time dedicated than otr mainly due to consistency. Thing about otr is the money is up and down all the time. On dedicated it stays consistent and as long as walmart is in business and we keep this account, I will have a job. Better to figure these things out, because leaving will cost you even more money. One of my biggest fears happened on the road, my brother had died yesterday morning. I got the call when i was driving on i5 headed to Portland, OR. Regardless of the feelings it brought to me, I had to keep a level head to keep myself and others safe on the road. It's a hard part of being away from home. Thankfully we have a terminal up here so I can drop the truck and fly home. Be safe everyone. Which company to go with as a rookie? Swift is prettt much going full auto. The walmart account I was on had a few manuals, but for the most part they are going full automatic. Depending on where you live swift can be a good fit due to all the dedicated accounts we have. Makes it easier to try things out without having to get a new job. Either way, good luck! Is It Safe to Truck In Louisiana? Could be possible that it was that way in the past. For example the TA in Albuquerque back in the day wasn't a very safe spot. Driver was hit over the head with a pipe and robbed. Now the worse thing that may happen there is a bum asking to polish your wheels. I rather stay at a truckstop in Lousianna over Memphis any day. I been to the TA in Lafayette and the TA close to New Orleans and had no issues. Typical sampling of run lengths for rookies? Really depends on a multitude of things. 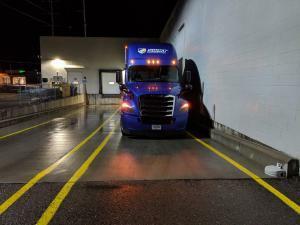 If the company runs all 48, do they only run east of i35, the frieght they pull, and another thing i notice is teams at my company tend to get the long runs due to them being able to cover more miles in a short amount of time. Longest run I have had is 2757 miles California to New Jersey, and loads as short as 1.5 miles in our terminal in Denver to the pallet place in Aurora. Biggest mistake I made in my driving career is concerning myself with length of miles on a load. As long as it adds up to 2500 or more at payday i am happy. The long runs are awesome, but a lot of the time you will have to run crappy loads, honestly the more crappy loads I run, the more planners are willing to help me out or give me something I want. Really until you can learn how manage your time, you will get loads that aren't as tight of a time frame, it takes a while to learn, but it will come with experience. Biggest word of advice I can give you is don't listen to old negative drivers, prove yourself to the company and they will take care of you. I used that system and passed no problem. The hard thing about it, is the tricky questions they ask. You have to read them very carefully. The split will come in handy tomorrow. I got two deliveries to Costco stores the last one is a small delivery, so I should be done by 800 am and parked down the street from my pick up at post. Pick up is btwn 1400 and 1800, i could probably do a ten and go to pick up a little later, but dont want to risk there being problems so ill do 8 hrs instead. Due to the next load being 1236 miles from Pick up and will deliver on the 30th, i need to put in big driving days, to shorten my driving on delivery day. That way I have more opportunities to continue running. I could make the delivery if I waited around all day and then picked up the load, but I would be driving 575 on delivery day. Makes more sense to flip my schedule and push it hard first and second day. This way I'll make it to Temple, Texas with a good 9 hours or more on the drive line. I finally understand what you are saying about the miles being our responsibility. The fact that they took off a load with more time on it/same amount of miles and gave me a load with a tighter window, I have to do what I can to prove my worth. Took me 2 years, but I finally get it. I have all my incidents listed on my dac and it cost me getting a new job. Goes to show how serious the job is and something as little as a bent rim is a lot more serious than I thought. I have improved since such incidents and do what I can to keep them from happening again, any incident big or small should be avoided at all costs. There is a reason why they are called preventable. If i am still hitting 2500+ a week, i dont care if it is long or short. As long as im hitting that number I am good. If you run dry van freight there is not much long distance runs. I have ran one cross country trip which was 2757 miles, but rarely do I see something that long. I idle all I want to stay comfortable. Get messages saying to Idle less, but make sure to stay comfortable for proper rest. Hardly get that message either. Just keep an eye on the dash when you idle when on a 34 because you will probably need a regen after sitting with the truck running so much, that usually happens for me. Swift, May Trucking, Heartland Express. I'm glad you're doing well. You've now experienced it first hand and sure you realize that local driving jobs are a beast. That 16 hour rule is a killer and quality time at home virtually non-existent lol. There is no way I'd ever consider personally going local but I have to admire your willingness to try just about anything and share your experiences with us. It's a crazy lifestyle we lead that many people cannot or will not ever understand, but I wouldn't trade it for anything. I was doing walmart dedicated with swift still so thankfully no 16 hr days. What got me was extreme schedule flipping and not enough time to do anything. It wasn't necessarily 100% local but was enough to show me I wouldn't like local. I'm a believer of trying things and the lifestyle I got otr was better it is just up to me to make sure i get proper exercise and eat better. Decided to go back. Was thinking of switching to reefer but wanted to stay with the Albuquerque terminal so ill be staying dry van. Hope I can get into one of those newer internationals or volvos. Either way I have found that my quality of life was better otr. I was more rested and had more quality off time. Also I was able to catch more concerts that i wanted to see. It was all about the money when i started, but now it's more about the lifestyle I can live. Hope you guys dont get bugged by my emotions haha, but I like to share these things. Guranteed somebody will come binge read my stuff some day and get some type of help from it. Bike rack, to go please. There are ways to do it, hopefully the guys that do will chime in. I just started to walk my whole 30 minute break whether it be around the truck, rest area, etc. Also try to walk for a few minutes here and there every couple hours or so when driving. Hey Dave, are you still at pride? I am considering going back OTR and was interested in them. Joe Rogan Experience, The Church of What's happening Now, tigerbelly, H3H3 Podcast, Talk is Jericho, Mad Fientist, and the list goes on. Have learned so much from podcasts.